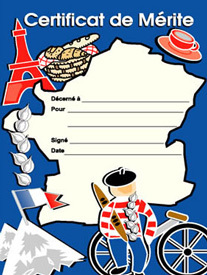 A5 French merit certificates that feature messages written in French. These are wonderful rewards that can be taken home and shown to parents / carers. These French reward certificates are essential for every primary MFL teacher! My students are motivated to get one, and are racing with each other to get one. Cute pictures. These certificates are absolutely incredible!